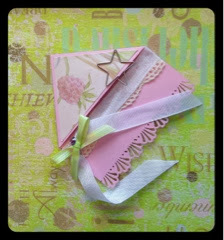 This week at Scrapendipity's Thursday make 'n take was a pretty corner bookmark. 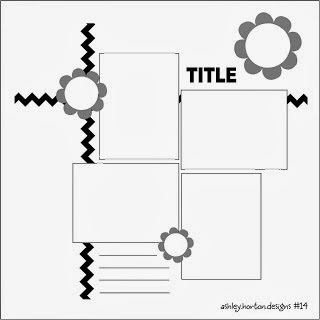 We folded in two corners of a a square piece of paper, covered the folded triangle with some patterned paper and then embellished with a border punch, lace, ribbons, a metal clip and a gem. Happy Monday and welcome to another Monday challenge with FCCB! I used the vintage sewing machine cut from the Heritage Cricut cartridge to die cut a piece of silver foil paper and paired it with papers and stamps from the Simon Says Stamp January 2014 card kit - love that little stitched heart! What can be better than combining my love of sewing with my love of papercrafting?!! This little grey crocheted flower and pink button were the perfect finishing touches. Be sure to head over to the FCCB blog to see all the other wonderful projects our amazing design team has come up with this week - and go ahead and add your own using 3 different patterned papers and a Cricut cut! There are so many wonderful techniques on Day 1 of the class Stencilled at Onlinecardclasses.com! For my third card I did the ink misting over a stencil. 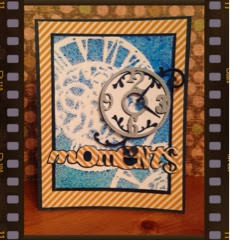 I used 2 shades of Dylusions blue spray ink over a Tim Holtz stencil to create the background. 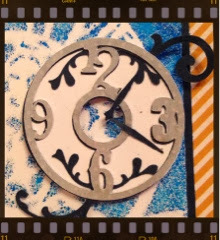 I layered it over some My Minds Eye patterned paper and used the Wall Decor and More cartridge to cut the sentiment and clock. I used the sketch from Mojo Monday. 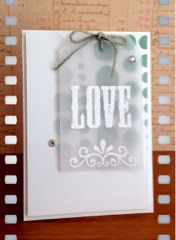 Continuing on with the amazing stencilling class at Onlinecardclasses.com, I made a variation of the first card, using a velum tag embossed with Distress Ink and an iridescent embossing powder, layered over a stenciled background piece cut to the same size as the tag. I layered the tag over a 6x6 piece of patterned paper with a pretty design and added a Prima flower and some hemp twine. I'm so excited! Another class at Onlinecardclasses.com! This one is a class called Stenciled - focusing on all kinds of fun stencilling techniques. Day 1 is Inking and Misting and for my first card I used Distress Inks sponged over a Dylusions stencil. I wanted a Valentines card for my hubby that wasn't too feminine and I thought this fit the bill. I cut a tag from vellum and used white embossing powder after stamping with Versamark ink. I used my Distress Ink to colour coordinate my hemp twine and popped my tag and background up on a white card base. Love the white on white on this card! A couple gems from Hero Arts add the finishing touch. Hope everyone is enjoying a wonderful Friday! Create a Project that uses a snowman! 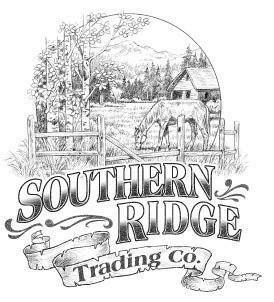 Be sure to visit the FCCB blog to view the other DT members' projects and to join in the challenge. Even though we have had way more snow than I think we should have so far, a snowman always makes me smile! I used the Stretch Your Imagination Cartridge to cut this guy, and since I used my Gypsy I was able to hide the face cuts and stamp it on with a Peachy Kean stamp. I did use the carrot layer for the nose though. I used some Fancy Pants paper for the scarf and mitts and after I layered everything I ran it through my Cuttlebug with the bubble embossing folder. The snowflake is cut with the Art Philosophy cartridge, sponged with Distress Ink and Stickled. I only glued the inner edges to the card to give some dimension around the outside. I used a paint pen to create the snow border along the bottom of the card and then stamped the sentiment in black. I stamped the background with snowflakes and used white embossing powder before attaching my snowman. Finally, I punched three little hearts out of patterned paper and added some clear crackle accents to give them an icy, crackled finish. Hope you are staying nice and warm and enjoying all the great snowman projects at FCCB this week! For this month's swap with Lefty Productions our challenge was to create ATC cards with the theme 'Release the Nerds'! I decided to settle on 2 different themes - my nerdy love of organizing and lists and my nerdy love of murder mysteries - especially from the 80's! I started with manilla ATC bases which I stencilled with Distress Paints and then sponged with Distress Inks. I stamped overtop with Archival Jet Black ink using some 7 Gypsies stamps and then added my elements on top, including some washi tape, a notebook border punched piece of paper, and some stickers. I wanted to share some of the fun cards we've made at the Thursday Make 'n Take with Scrapendipity the last couple weeks! We used Gellatos for the first card - so much fun! We blended with a baby wipe and stamped on top of the background and then stamped and heat embossed a large flower stamp on the centre piece. I added a sparkly brad and some pink Stickles to the centre of my flower. 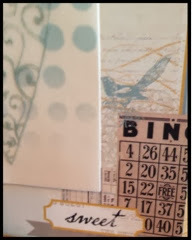 I used the Simon Says Stamp set included with the January card kit for the sentiment on the inside. We die cut the butterflies from foil paper and then used a coordinating embossing folder to add embossed highlights to the large butterfly. The background is stamped with a script stamp and the flowers are stamped with Versamark and then we applied Perfect Pearls - so pretty! Of course after Make 'n Take I had to do a bit of shopping in the Scrapmobile - parked right on site!! I picked up this cute Magenta girl stencil and the Tim Holtz clockwork stencil and decided to make a tag. I used Gesso to stencil through a Heidi Swapp heart stencil and used Distress Paint to stencil through a Crafters Workshop arrow stencil. Then I sponged on Distress Ink and stencilled on the clockwork, girl, circles and honeycomb stencils with Distress Inks. After, I stamped on some 7 Gypsies stamps with Archival Ink and added a gem and clip. I love how the Gesso and Paint resists the inks! Here is my project - I used the Believe paper from Heidi Swapp for the background snowflake and black script and brightened the layout up with a Cosmo Cricket collection. I used Create A Critter, Art Philosophy and Gypsy Wanderings Cricut cartridge cuts for the title, trees, snowflakes and snowman. popped up with foam dots. Stickles give this guy sparkle! with the Fun cut on the Gypsy. Congrats to Mayra from Mayrasdesigns.blogspot.com! Hope you are having a crafty week! 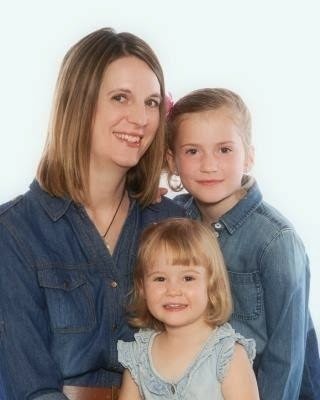 I just love the pics I take of my girls having fun together! 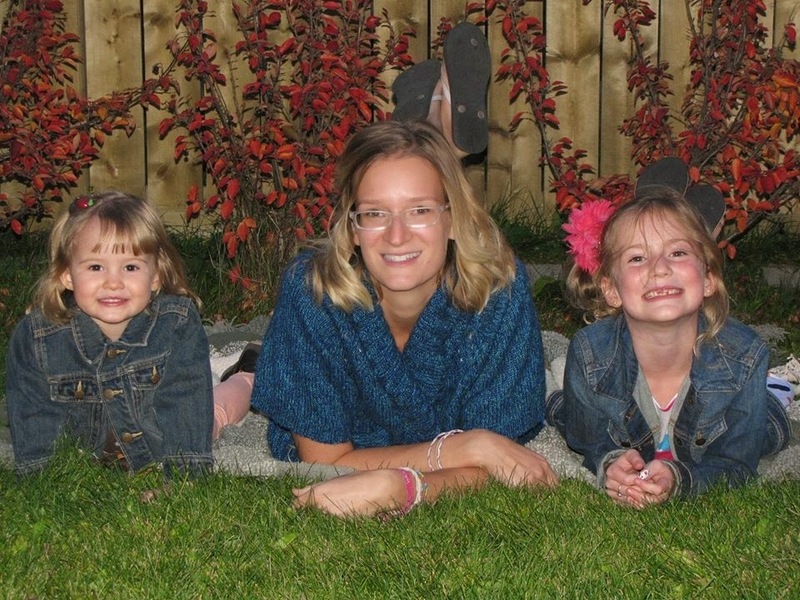 Amie loves helping her little sis, Erica, and I know they are going to be forever friends as well as sisters. The main theme this month at Scrapping Everyday Miracles is Friends Forever and they have an awesome layout sketch as well! This layout fits into both those categories. I used some patterned paper by Recollections from Michaels and stickers from a CTMH pack. 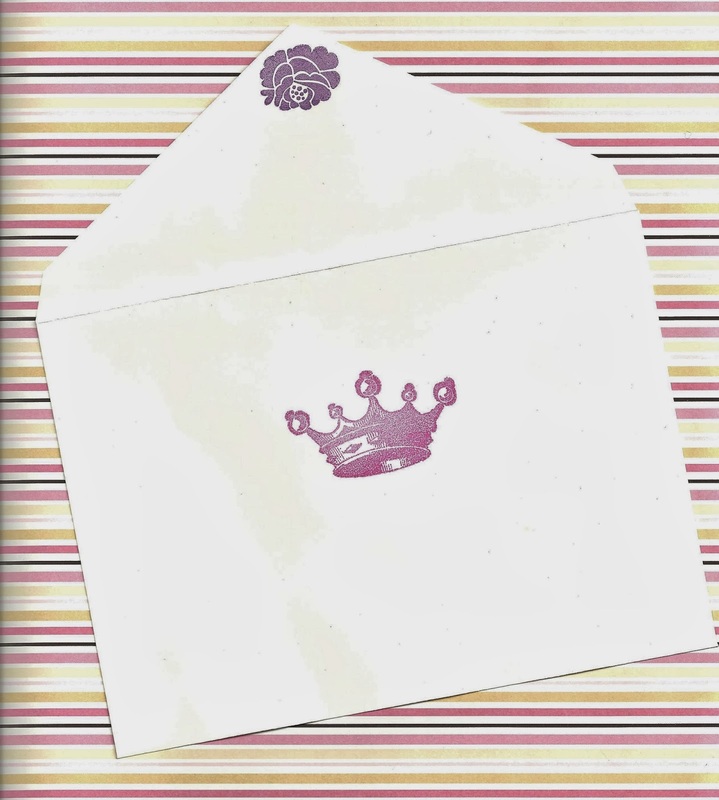 The stamps are also from CTMH, and I added some paper flowers with sparkly brads in the centre. 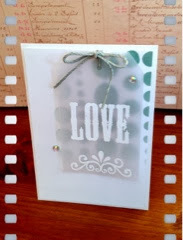 I sponged some Distress Ink on the punched border edge of my paper strips and added some Stickled dots. Of course I had to add some Stickles to the butterfly and flowers for some sparkle as well as a few gems! Hope you are having a crafty weekend! 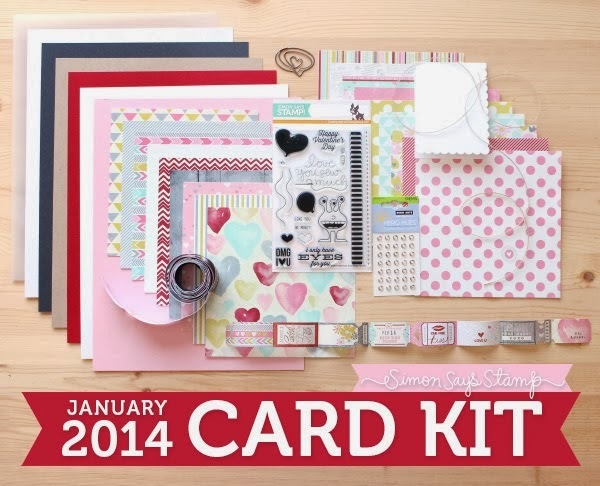 The Simon Says January card kit this month is so cute! I just love the stamp set included, and there are so many fantastic goodies to make lots of super cute valentines! I used the adorable alien, stamped twice, for this card. I made one alien a girl by adding eyelashes and a sparkly bow (using the December card kit) with a gem in the center. I stamped on watercolour paper and used Tim Holtz Distress markers to watercolour the image and then used Stickles to add sparkly polkadots. I stamped sentiments directly on the heart patterned paper and used the balloon string included in the stamp set to make 3 balloons. 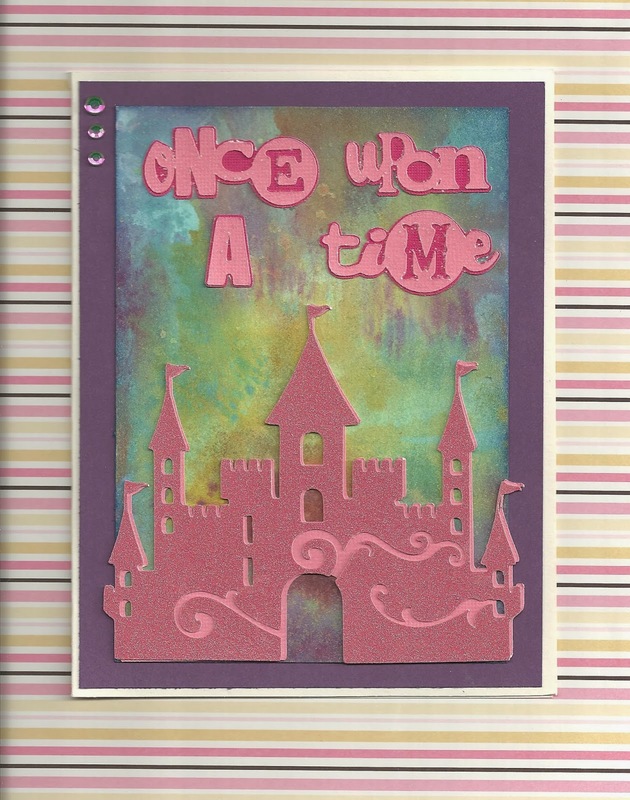 I really like the stitching stamp and used it around the border of the card. I hope you are getting some cute valentine crafting in! 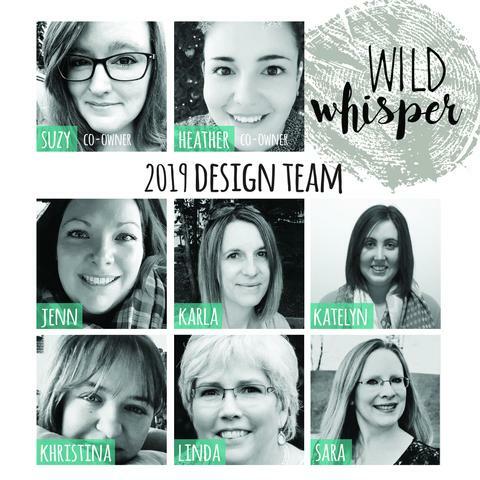 Don't forget to check out my first post as a Design Team member for Fantabulous Cricut here and enter your name to win some fun blog candy! 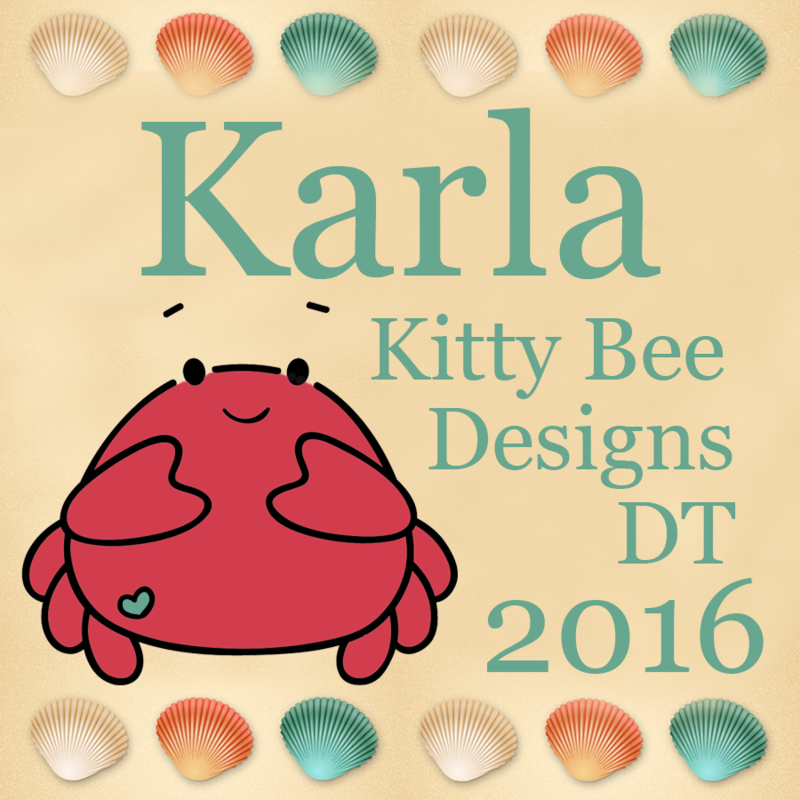 I am sooooo very excited to join the Design Team for the Fantabulous Cricut Challenge Blog!!! It's a new year and to start it off we have an amazing blog hop planned for you! The challenge this week is to use a sentiment, and as always, use a Cricut cut. 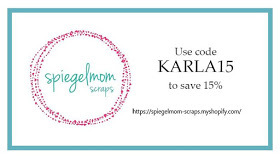 Our sponsor this week is Scrappy-Moms Stamps. Link up your project at FCCB and you will have a chance to win an awesome stamp set!! For my project this week I used the Wall Décor and More Cricut Cartridge to create a birthday card for my little girl who will be 7 at the end of the month! I started with Distress Paints on my craft mat, which I spritzed with water and pressed watercolour paper into. After drying my background I went over it with Distress Inks to create a beautifully blended background. This is my favourite way to make a background - so easy, but looks so detailed! 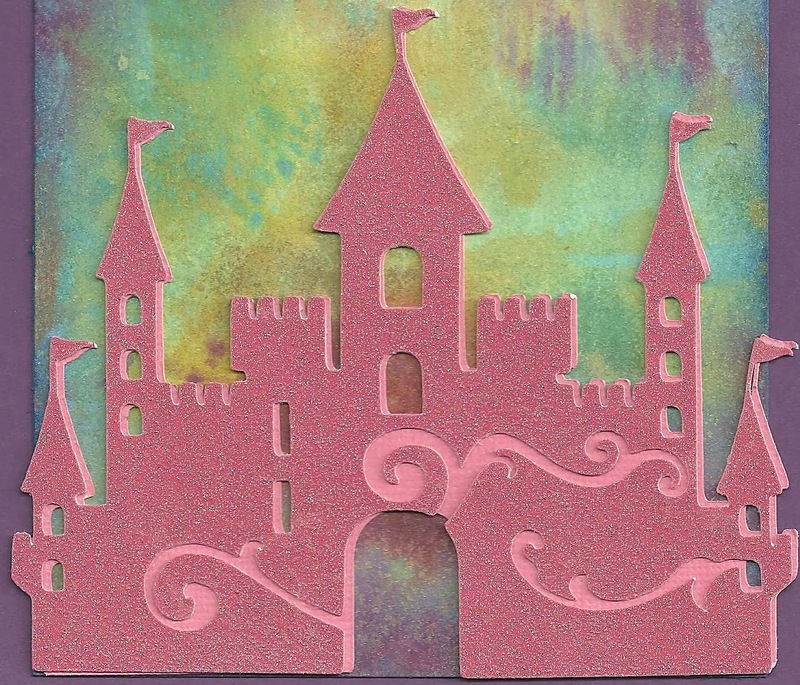 I cut the sentiment, shadow, and two layers of the castle with the Wall Décor and More cartridge and slightly offset the castle to create a bit of a shadow. 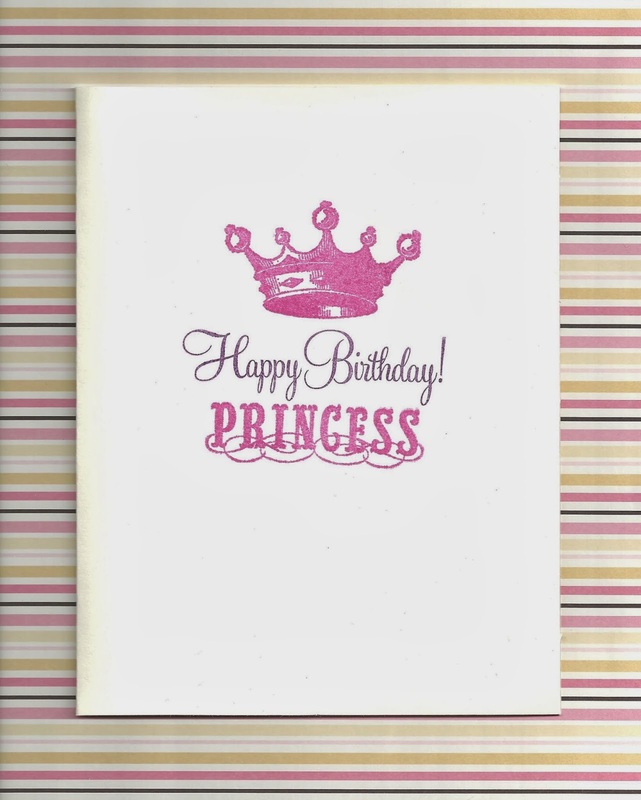 Of course, I had to use glittery cardstock for a princess card! I am giving away some blog candy to one lucky winner! Leave a comment and become a follower and I'll choose a winner next Monday, January 13th to win a Valentine Card Kit, which includes 8 card bases, 8 coordinating patterned papers, a tiny envelope, a Bee Mine stamp set from CTMH, 4 lengths of twine, 8 paper banners, 4 chipboard tags, and 8 stamped Valentine images to colour (4 on watercolour paper and 4 on cardstock)! Next stop on the hop is Cool Beans by LB! Be sure to check out her project. Thanks for joining me and have a Fantabulous week! !